Former Middleweight champion Kelly Pavlik is out of rehab and trying to get back into the boxing ring, targeting the undercard of Pacquaio-Mosley this Spring for his return. Pavlik, who hasn't fought since losing his Middleweight title last April to Sergio Martinez, was admitted into the Betty Ford clinic late last year shortly after he pulled out of his bout with Bryan Vera on the undercard of Pacquiao-Margarito. The oft-injured, or should I say liquored up, Pavlik's inactivity has costed him potential fights with Paul Williams and Super Middleweight champion Lucian Bute over the years. A win will get him right back into the relevant circle. Pavlik will probably be fighting above 160 and should he win, he'd be considered as a fall opponent for Bute in what would be a great fight for the Showtime network. If he decides to go the HBO route, I still think Pavlik-Williams will make a great fight for their network. Don't be surprised, however, if Bob Arum and the Top Rank Boxing Leagues opts to keep it in-house with a potential clash against Julio Cesar Chavez Jr. 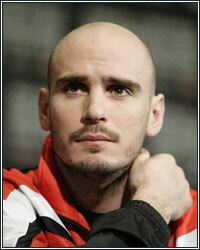 Either way, it's nice to see Pavlik back again and hopefully sobered up. Hilarity continues to ensue as WBA champion Amir Khan tries to find a pasty opponent for his fast approaching April 16th date on HBO. Lamont Peterson and Paul McCloskey have already been turned away because they believe they're getting lowballed, and talks with Michael Katsidis ended as soon as they began. I guess Khan doesn't command that much money as one is to believe. Khan's former conqueror, Bredis Prescott, and his last opponent, Marcos Maidana, are both telling Khan to man up and fight them again, but Khan has already scratched them off as potential opponents for the Spring. I don't know who he is going to fight, but with his luck right now, HBO might not even approve his opponent unless Tim Bradley decides to hop on a plane to make the fight. Well, if a soft puncher who is willing to go to the U.K. is what Golden Boy and Khan are looking for, I can give Jesse Reid a call and Paul Spadafora will be ready for the April date for sure. While we will unfortunately have to live through Juan Manuel Marquez's impending title defense against the faded and shot Erik Morales, Robert Guerrero is liking his chances of landing a fight with Marquez some time this year. Guerrero has always been on the short list for Marquez, being that they are both promoted by Golden Boy, but Marquez isn't interested in the fight because Guerrero brings nothing to the table financially. In all honesty, Guerrero-Marquez wouldn't be a bad fight at all, but Marquez is all about the money right now and unless Robert has changed his last name to "Pacquiao" or "Khan," odds are that Guerrero is going to have to find someone else to keep him busy. May I suggest comebacking Juan Diaz, who I have heard is preparing to fight again later this year.